A trailing stop is commonly used as a systematic way to know when to exit a trade. As the market moves higher or lower the trailing stop follows at a predetermined level giving the market room to fluctuate and then continue on its path, or should the market reverse the trailing stop provides a systematic level at which to close a position. These types of stops are especially useful for trend traders and breakout traders who like to let profits run while maintaining a logical exit for when the market trend changes so they can exit their position in a controlled and timely manner. We have programmed two sets of trailing stop indicators. The first set uses average true range (ATR) when determining placement of the trailing stop. The ATR of the market is calculated first and once calculated the ATR is multiplied based upon how tight or loose the trader wants to set the trailing stop as it follows the market. The second set of trailing stop indicators trail the market at a fixed percentage set by trader. Both sets of trailing stop indicators are included. During a bullish run in MSFT the long (yellow) trailing stop continuously follows the market higher until the market reverses and crosses the trailing stop. Once crossed the short (red) trailing stop is activated and begins to trail MSFT lower. In the chart below the forex market begins a bearish run, accompanied by a short (red) trailing stop. After a period of consolidation the market becomes bullish triggering the long (yellow) trailing stop. Later the short trailing stop becomes active again. Click to view all trailing stop indicator screenshots. As you can see in the charts above the indicator continually alternates between long and short trailing stops, changing color as it goes. Both the ATR trailing stop indicators and the percentage trailing stop indicators allow you to adjust at what level to initially set the trailing stop and from what price to trail the stop. When applied to a RadarScreen the trailing stop indicator provides additional information beyond the value of the trailing stop. 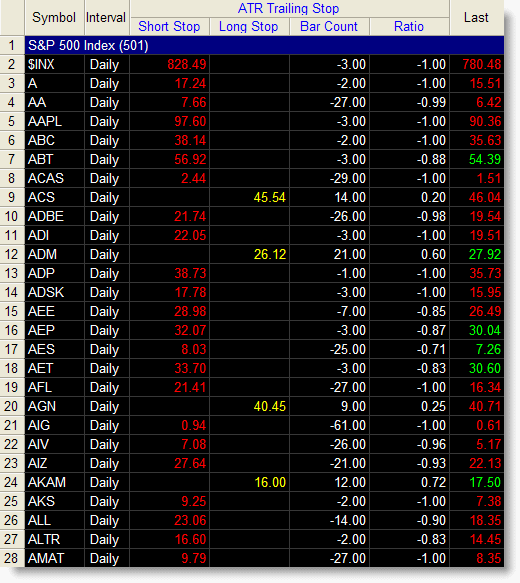 Bar Count – shows how many bars that the current trailing stop has been active. 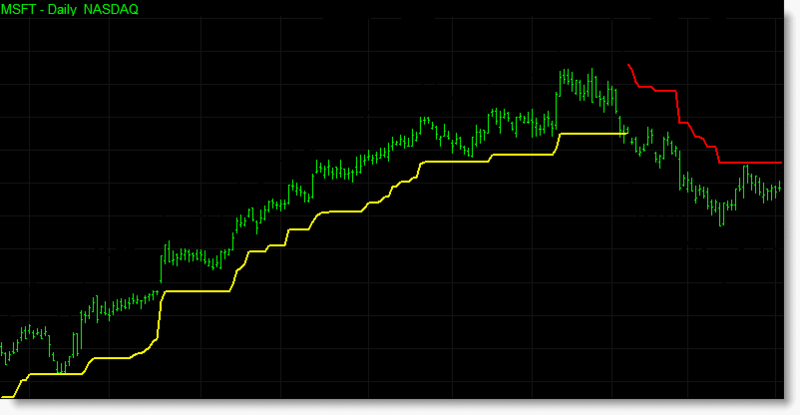 Ratio – shows where the current price is in relation to the active trailing stop. The ATR trailing stop indicator applied to a RadarScreen containing the S&P 500 stocks. 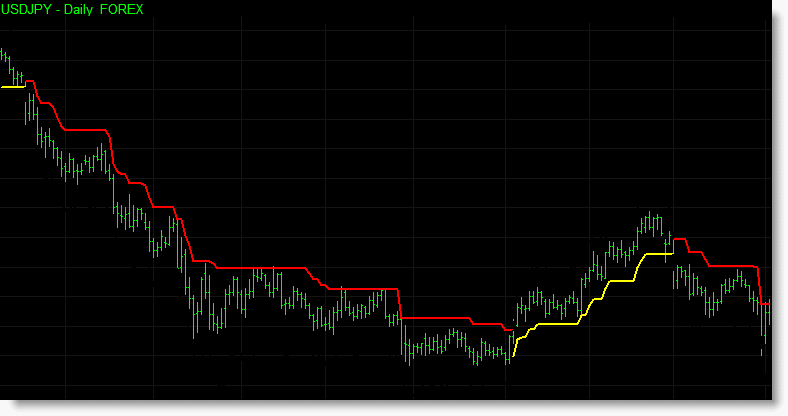 Click the button below to add the Trailing Stop Indicator Set for TradeStation to your wish list.